A deck or patio can provide delightful outdoor living space and greatly increase the value of a home. Decks come in various styles and sizes, and they are typically constructed from natural wood, solid composite wood, hollow composite wood, vinyl, or environmentally friendly composites. Natural wood provides a beautiful look at an affordable price, but many homeowners choose to go with other options because wood requires higher maintenance. Vinyl and composite materials are more durable and resistant to rot, but tend to give a more man-made appearance. Platform decks are built low to the ground and may or may not require a railing. Raised decks sit several feet or more above the ground and require foundation posts, railings and stairs. Two-story decks offer outdoor access from upper floors and provide plenty of outdoor living space. Multilevel decks are a series of decks connected by walkways or stairs, and are used most often on sloped lots. Freestanding decks are not attached to the house and are usually located where they can provide the most attractive views. 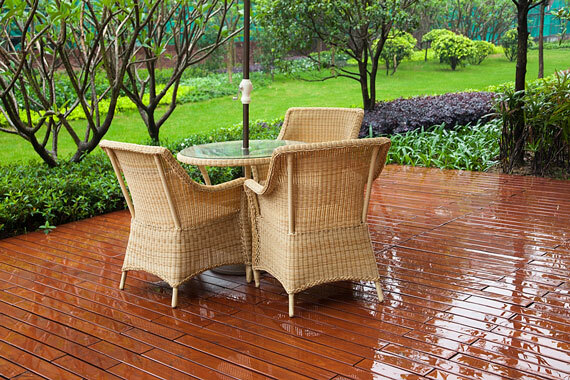 Some decks have extra features such as attached gazebo areas or built-in benches. A deck with a roof may be fitted with screens or windows, creating an indoor/outdoor space that can be enjoyed year round, especially with the use of an electric, kerosene, or propane space heater. Patios are usually made of concrete or paving bricks and also come in a variety of sizes and styles. Open patios maximize exposure to sunlight and fresh air, while covered patios are usually adjacent to the house with eaves or another overhead structure offering shelter from the elements. Getaway patios are located away from the house and are usually surrounded by landscaping that maximizes privacy. Poolside patios are located adjacent to in-ground swimming pools and provide a waterproof, slip-resistant surface for swimmers and sunbathers alike. 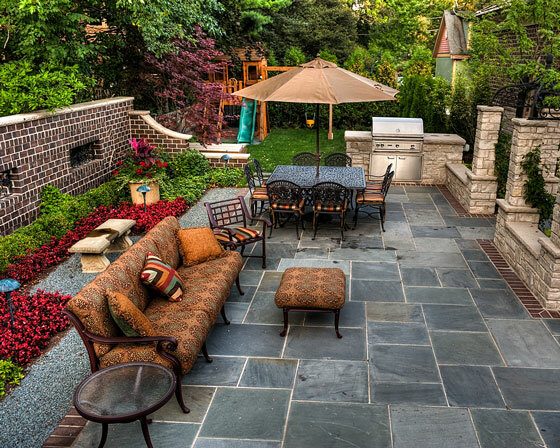 Decks and patios are often the best locations for a charcoal-fired barbecue grill or a propane gas grill, and they offer the perfect space to arrange outdoor furniture and plants for a relaxing oasis or inviting social atmosphere. A well-planned deck or patio can be like an extension of the home and provide outdoor enjoyment for years to come. Aboveground swimming pool guide and supplier directory. Barbecue grills, smoker ovens, and outdoor fireplaces. Find bird feeders, bird houses, birdbaths and birding resources. Guide to planning an outdoor deck for your home. Landscape lighting and outdoor lighting fixtures. Guide to swing sets, backyard gyms, and outdoor play sets. Wicker furniture selection and care guide, with supplier links.